Sunday Surprise: A Few Loose Ends! This week's Sunday Surprise is a mixed bag of goodies. First of all, I promised that I would find a way to share my remaining Toy Box Monthly subscription boxes with you, so I'll start things off by quickly (?) revealing those items. Magic Nursery Holiday Baby (discontinued). I wish I had a new review to offer today. I have three things in the works--none of them quite finished yet. Despite that, I didn't want to let the day pass without expressing my heartfelt thanks to all of you. You've kept this blog alive with your encouragement and suggestions, and you make this a special place for me with your kind, cheerful, knowledgeable contributions. Thank you. I hope all of you have a relaxing, happy, safe Thanksgiving! I've gotten sidetracked by a lot of different things--good and bad--over the last few weeks and haven't had nearly enough time for dolls. Most recently, the local high school's fall musical has taken a lot of my attention...in a good way. Every year I'm awed by the range of talents that teenaged kids possess--not just their skill in singing, acting, dancing and playing instruments, but also their aptitude with the intricacies of set design, lighting effects and sound engineering. It's amazing to watch. Anyway, in the midst of this flurry of fall activity, I realized that American Girl had released a new line of play dolls: the WellieWishers. Before this discovery, I'd been feeling like I was probably done with American Girl dolls. My mini Kaya and my new diabetic Lea are wonderful, and I didn't feel the need for any new additions or reviews. But then I saw Melody (a new character in the Historical line) and her Recording Studio. Wow. She's incredible. Her introductory statement is, "Fairness and equality for all people sound like music to my ears." Indeed. Needless to say, Melody's 1960s world sucked me right back in. All of a sudden I was pouring over the catalog and searching the online store again, wishing I could try out Melody's piano or play with her detailed studio. And that's when I discovered the WellieWishers. Wellie Wishers "Kendall" from American Girl ($60). Sunday Surprise: A Mystery Reborn Baby! I mentioned last week in my Saskia Project post that I've been anticipating the arrival of a surprise reborn baby for the past month. I ordered this baby because I adore surprises, of course, but also because I was curious to see another reborn doll up-close. I thought it might be helpful for me to see a reborn artist's work as I struggle with Saskia's paint. This mystery baby arrived a few weeks ago and I finally opened the box on Wednesday. It has definitely been helpful to look at how this baby was completed. I'm also very grateful for the tips and encouragement from all of you! I feel re-energized in my efforts to make Saskia as nice as possible. Thank you. For anyone arriving late to this party, I'll quickly explain what a surprise reborn doll is. A reborn doll is a made-over play doll or a doll assembled from a kit. Typical reborn kits include a blank vinyl head and limbs and perhaps an unfilled cloth body. That's it. Artists and collectors paint these kits, add eyes and hair, and assemble the parts onto stuffed, weighted bodies. 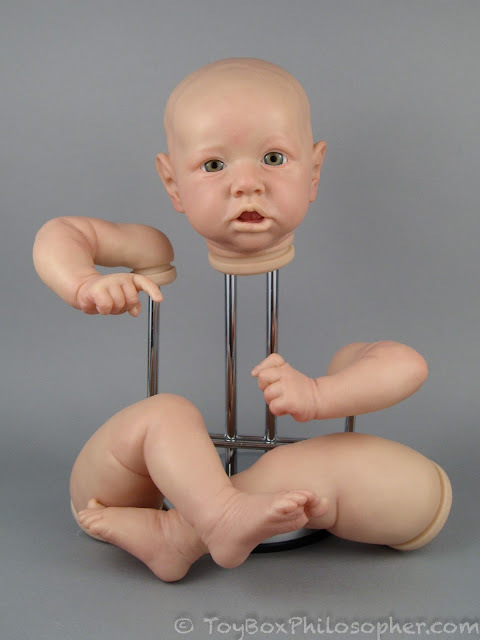 A surprise reborn baby is a completed doll offered for sale by a reborn artist, but all of the characteristics of the doll are left up to the artist to decide. These qualities are kept secret from the buyer...to add a fun element of mystery. So, I did not know this baby's gender, size or appearance until I opened the box! 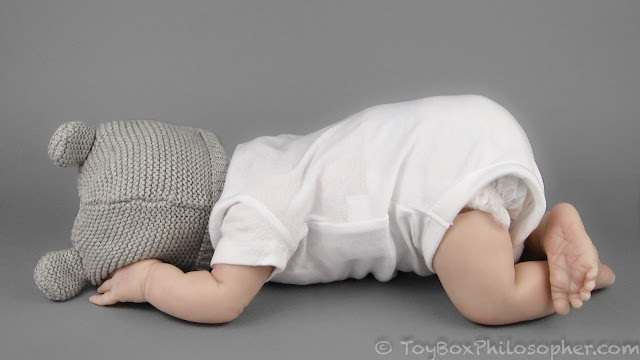 I searched high and low for just the right surprise reborn doll. There are many different options out there--both on eBay and on Etsy. I spent a lot of time looking at artists' past work and reading their customer reviews. I finally found a shop with good prices, good reviews, and a light-handed painting technique that I admire: Brenda's Reborns over on Etsy (Brendasreborns). Brenda charges $130 for her surprise reborn babies, and also offers a large selection of custom dolls ranging from $130 to $300 (for a set of twins). I told Brenda that there was no hurry, but I still received my baby quickly--about three weeks after I placed the order. Surprise reborn doll by Brenda's Reborns ($130). It's time for another project series! 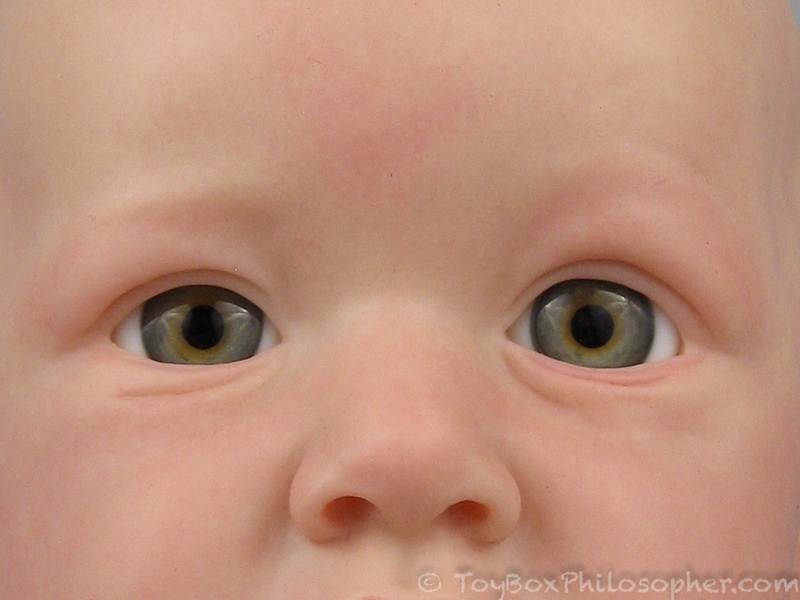 I'm looking forward to this particular project because it addresses my very earliest adult doll interest: babies. 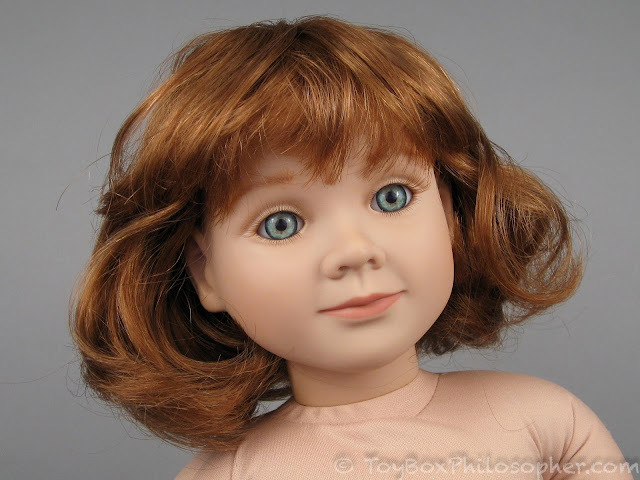 When I began to pay attention to dolls in my early twenties, it was the realistic baby dolls (from companies like Lee Middleton, Gotz and Zapf) that grabbed my heart--probably because I was ready to have real babies of my own. I collected vinyl art baby dolls for many years, and even accumulated a few precious one-of-a-kind clay babies. Right around the time that my doll preferences started shifting towards child and fashion dolls, the "reborn" phenomenon emerged. The process of "reborning" (terrible word, if you ask me) originally involved taking an inexpensive play baby, like a Berenguer, and making it over to look more realistic. The makeover could include a new coat of paint, new eyes, new hair, or even a new weighted body--many of the things I attempted in the My Twinn Project. However, as reborning became more and more popular, several well-known artists and doll companies began offering unpainted doll kits (basically just vinyl heads and limbs) to replace play dolls as the starting point for this process. I've re-painted and re-wigged a few $15 Berenguer play dolls in my day, but I've never purchased one of these premium doll kits...until now! My mission in this series is to complete a popular doll kit--the "Saskia" sculpt by Bonnie Brown. 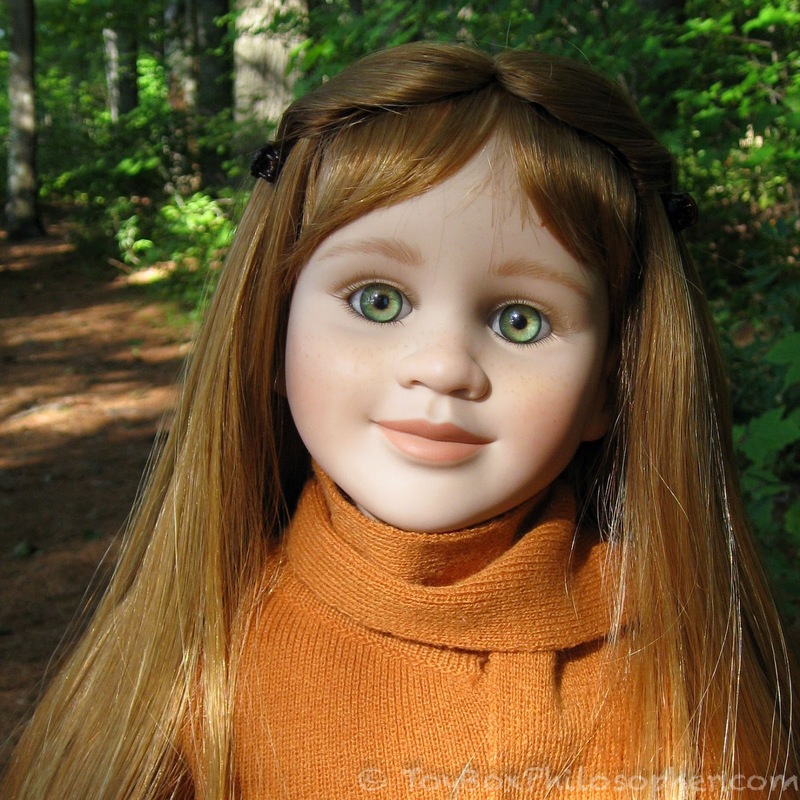 I will attempt to paint this doll, find her some nice eyes, micro-root her hair (ahh! I am so nervous about this part! ), assemble her onto a weighted body, and dress her to look cute (that part will be fun). I can tell you already, it's gonna be a bumpy ride. Sunday Surprise: Magic Nursery Toddlers by Mattel! My goodness, Sundays come around quickly, don't they? This used to feel like a bad thing because Sunday symbolizes the dwindling weekend. While Saturday morning is filled with possibilities, Sunday morning is time to clean the bird cages, vacuum the dog hair, and get ready for another week of work. Sundays have transformed a bit in my mind recently, though. I have a new-found appreciation for Sunday because this is the day when my son calls home from college...and also because it's the day when I get to look at another surprise doll! The Sweet e.Baby that I reviewed during the last Sunday Surprise had a secret gender and a secret name hidden with a CD...technology that was new enough in 1999 to feel magical. In 1990, about a decade before the Sweet e.Baby, Mattel came up with a doll whose gender was hidden within another seemingly-magical concoction: a dissolving hospital gown. Yes, that's right--a gown that completely disintegrates in water to reveal the gender announcement (and a new outfit). Mattel called these babies Magic Nursery dolls. The idea might sound far-fetched, but it was wildly popular. My parents should thank their lucky stars that I was not a child of the 90s, because this kind of toy would have been completely irresistible to me. It's even irresistible to me now, almost thirty years later, when unopened Magic Nursery dolls--with all of their surprises still hidden--can cost a small fortune. Magic Nursery Toddler doll by Mattel (1990). I was nervous about watching Star Wars: The Force Awakens, as I imagine many children of the 80s were. The original Star Wars trilogy was such an important part of my childhood, I needed this continuation of the story to be good. And it was good, I thought. A bit predictable, certainly, but an awful lot of fun. I laughed and cheered and even gasped a few times. The thing on my mind as I was walking out of the theater had little to do with the plot or the well-loved older characters, though. I was focused primarily on Rey, the new female protagonist. She is awesome. I think Daisy Ridley's spunky and intelligent interpretation of this mysterious girl from Jakku transformed Force Awakens into much more than the simple nostalgia-ridden adventure than it might easily have been. Because of Rey, I'm impatiently eager to find out what happens next in this new saga. My reaction to the Rey character might be exaggerated, but it compelled me to immediately start scouring the internet for Rey paraphernalia. I bought several of the less-expensive action figures (a few of which I'll show at the end of the post), but found their resemblance to Ms. Ridley disappointing. When I saw the promotional pictures of Hot Toys' Rey online at Sideshow Collectibles, I wasn't convinced that she was the perfect tribute to the character, either. However, after a few days' reflection, I decided that she was easily the best option out there, and so I placed my pre-order. I ordered Rey in January--a few weeks after I saw the movie--and she arrived in mid September. 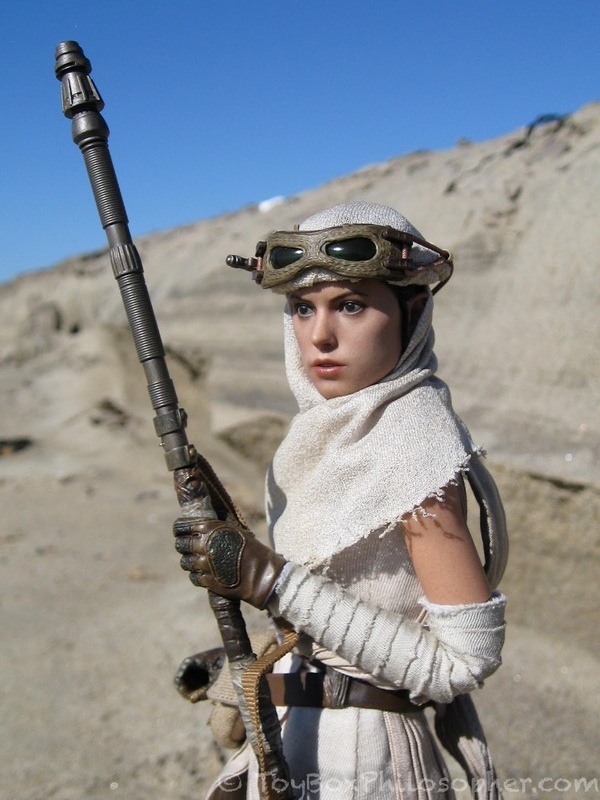 1:6 scale Star Wars: The Force Awakens "Jakku Rey" from Hot Toys, $224. Sunday Surprise: Sweet e.Baby From Playmates! I've been having an incredible amount of fun hunting around for surprise dolls. The really good ones are rare, but exhilarating to find. I think the most intriguing examples I've found so far have been vintage items, many from the mid to late 1990s. 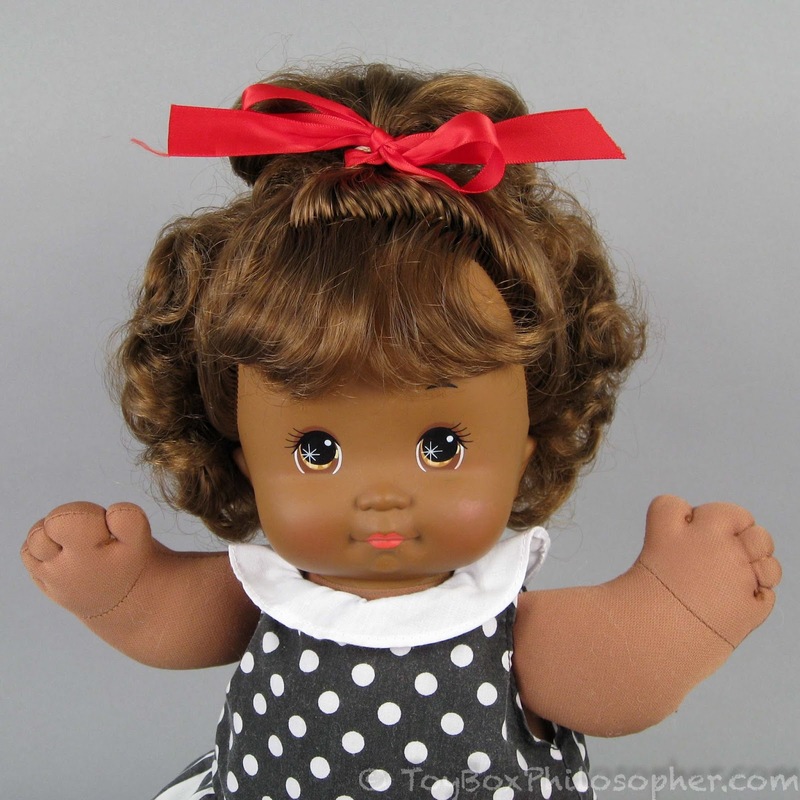 Today's doll, the Sweet e.Baby from Playmates Toys, is no exception to that rule. This baby is from 1999 and features a computer CD containing...wait for it...the baby's secret gender and name! Oh, yay! I have no idea how I got lucky enough to find this gem. I was browsing eBay for a Magic Nursery doll (coming soon!) and I stumbled on the auction for this little one. I'd never seen this type of doll before and I haven't been able to find another one for sale anywhere. I paid $45, which seemed like a fair deal given the doll's scarcity. I couldn't find any substantive information about this brand online. There are two pictures of dolls in their boxes--but that's it. It's almost like they never existed. Sweet e.Baby doll and CD from 1999. I suspect that for normal people, enthusiasm over a television show is what prompts interest in any dolls or toys related to that show. For me, though, things are often backwards: I see a doll I like, and then (maybe) I watch the television show associated with that line. That's what happened with the Miraculous dolls, anyway. I was doing some college shopping at Target with my husband, and we, you know, just happened to pass through the toy aisle. He was geeking out over Project Mc2 Bryden's coding shirt while I wandered further down the aisle and discovered some highly-articulated dolls from Bandai that showed real promise: they had appealing anime faces, visible wrist and elbow joints (yay! ), and only cost $14.99 each. There was even an intriguing ladybug theme...which I didn't quite understand. 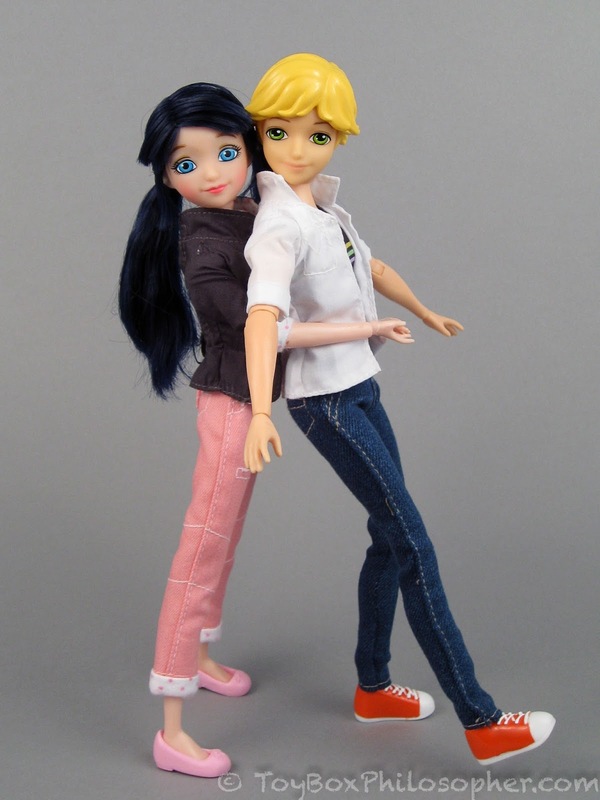 The only problem was that I had no idea who the characters--"Miraculous" Marinette and Adrien--were. Remember, I don't have cable television in my house, nor do I have any children under the age of sixteen. Marienette (left) and Adrien (right) from the Miraculous television series. $14.99 each. Sunday Surprise: Bratz Lil' Angelz! Happy Sunday! Today's post was originally going to be short, but it's morphed into something a bit more substantial. I'll explain. What started me on this path was the discovery of a Bratz Lil' Angelz "Secret Surprise" set a few weeks ago. I flipped out. I mean, any toy that has both the words "secret" and "surprise" in the same sentence has got to be good. And this toy looks amazing: it has a small baby doll with a secret gender, a hidden eye color and a hidden hair color. The set also includes two shrouded pets of unknown species! Doesn't that sound like fun?? But the other thing that makes this set so great is the fact that I knew nothing about the Bratz Lil' Angelz dolls before I saw it. I have no idea how these babies escaped my radar, but I absolutely love discovering a new kind of doll. Immediately after purchasing the Secret Surprise set, I made it my mission to learn more about the Bratz Lil' Angelz. In doing so, I realized that surprises are a bit of a theme with this line. I found two other sets (Pet Shop Surprise and Surprise Litter) that involve some kind of hidden feature. I bought an example of each of these toys to show you today. So, this post will feature three Bratz Lil' Angelz surprise toys, not just the set I originally bought. The Bratz Lil' Angelz are all discontinued, but the silver lining is that none of the toys I'll show you today seem particularly expensive or hard to find at the moment. I have to say, though, I think I got really lucky with the Secret Surprise set. I found it for $10.24 on eBay, which is close to the original price. The only other example I've been able to find is a blue version on Amazon for $83. Yikes. Of course I'm going to save the Secret Surprise for the very end of the post, but here's a preview of the wonderfully mysterious baby from that set...who looks like he/she might have red hair! Bratz Lil' Angelz Secret Surprise baby (discontinued). Here, at long last, is the finale of the My Twinn Project! Amidst back-to-school pandemonium, an emergency bathroom renovation and adventures with a sick parakeet, I finally found a free morning to take the My Twinn crew to a nearby state park for their final photo shoot. My original intention was to re-publish all of the installments of this project as one big post--so you wouldn't have to click back and forth. However, since the installments ended up being longer than I intended (big surprise), I will just link back to part one and part two for those who would like to see all of the details. For anyone who has been following along, I'll simply supplement today's post with little reminders of what I've already done. Restored Denver era My Twinn Tasha doll. Sunday Surprise: Toy Box Monthly Subscription! I'm sure many of you have heard of subscription boxes like Loot Crate and Birchbox. The idea is that you sign up to receive a mystery box of stuff every month. These subscriptions have become so popular, it's now possible to get boxes with just about any theme you can imagine: pet supplies, books, cosmetics, food, crafts...and toys. My son and I tried a subscription a few months ago called The Mystery Experiences Company. This company sends out a detailed mystery to be solved every month--each with little puzzles, artifacts and clues to help with the solution. This was fun, but we discovered quickly that we didn't have the time or patience to dig into a complex new mystery every month. When I was canceling the mystery subscription, I spotted Toy Box Monthly. For $20 ($15 plus shipping), this company sends a little box of mystery toys every month. This sounded like the perfect thing for the Sunday Surprise! I should mention right off the bat that the Shopkins Lil' Shoppie shown below did not come in the subscription box. So why am I showing you a picture of her? Well, I didn't want to give away what was in the subscription box (that would ruin the surprise!) but also, these Shopkins items will make an appearance at the end of the post. That's all I'll say for now. Shopkins Rainbow Kate ($5.49) and a Happy Places blind box ($2.99). Well, this is the last week before I take my eldest son to college, so the blog is getting ignored a little bit. It's a crazy, emotional time and I don't want to miss anything with my kid. I should also explain my delay in posting the conclusion of the My Twinn Project. I haven't lost enthusiasm for my rejuvenated 23" girls by any means, it's just that I'm finding it difficult to choose a space where I can photograph four large dolls. I'll figure it out, though. Some of you might be a little surprised to see that I'm reviewing more Project Mc2 dolls today. Even though I'm a huge fan of science and S.T.E.A.M.-related toys, I didn't have a completely positive reaction to the first wave of Mc2 dolls. As a quick reminder: I reviewed McKeyla McAllister and her lava lamp almost exactly a year ago, and was disappointed by the doll's floppy, flaky articulation and bad hair. I was also underwhelmed by the science content that accompanied the lava light project. However, the line redeemed itself somewhat because of the fun assortment of geeky clothing, the nice faces and inset eyes on the dolls, and the entertainment value of the project accessories. 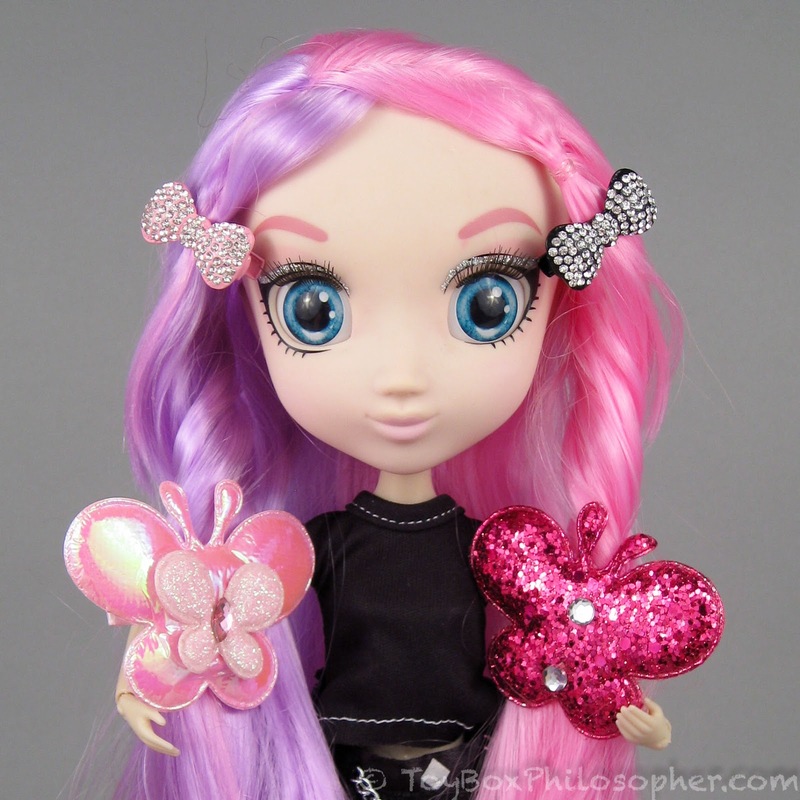 I managed to observe the release of the second wave of Project Mc2 dolls with only mild interest and no purchases. However, when MGA Entertainment added a redheaded character to their most recent collection of dolls...my self control crumbled. Not only do I love the look of the new Ember Evergreen character, but I was also tempted by the most recent version of my favorite Project Mc2 girl, Bryden Bandweth. In this review I'll take a look at both of these dolls and their S.T.E.A.M.-related accessories. Sunday Surprise: Cabbage Patch Kids Surprise Newborn Twins! I have a long-standing fixation on toys with surprises or mysteries. Things like Kinder Surprise eggs, for example, send me into fits of glee. I love blind bag toys, vending machines and grab bag specials, too. 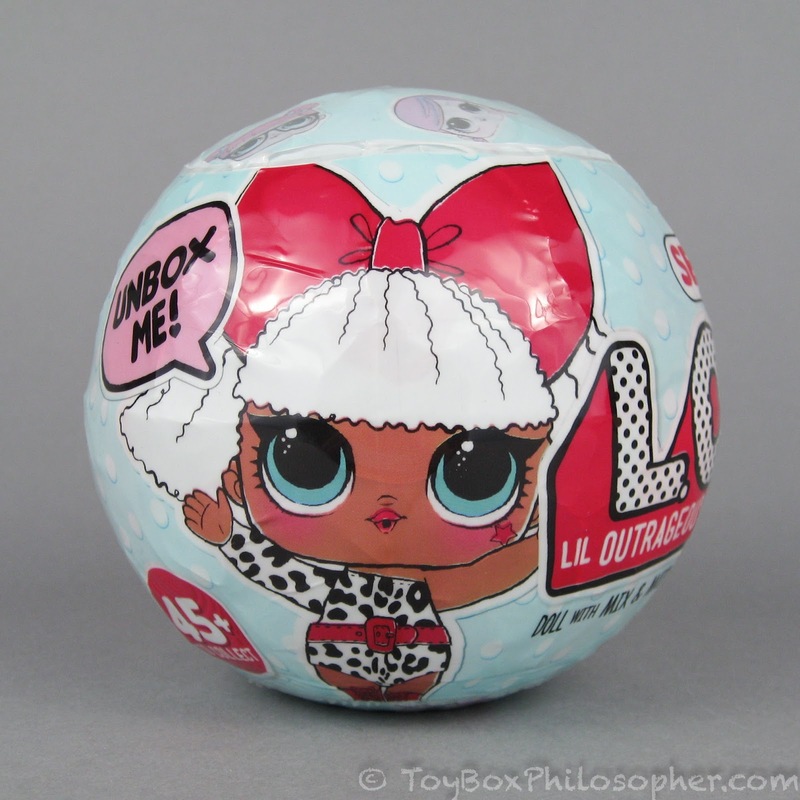 If a doll has a secret accessory or gift displayed in its box, odds are good that I'm going to want it. Because of this obsession, I've decided to introduce a new feature to the blog. It'll be called "Sunday Surprise" and will include short reviews of surprise-themed toys...on Sundays. I might not be able to come up with one of these every single Sunday, but that'll be part of the surprise! I already have a bunch of amazing toys that I can't wait to share with you. This whole idea is beyond exciting for me, so I really hope you'll enjoy it, too! My favorite kind of toy surprise is probably the mystery name of a doll. You might remember how thrilling I thought the Cabbage Patch Babyland Mini dolls were with their little hidden birth certificates. I can't believe that those cuties were on the shelves for such a short period of time. I decided that the perfect toy to start this series would be another Cabbage Patch Kid mystery item: the Surprise Newborn Twins! 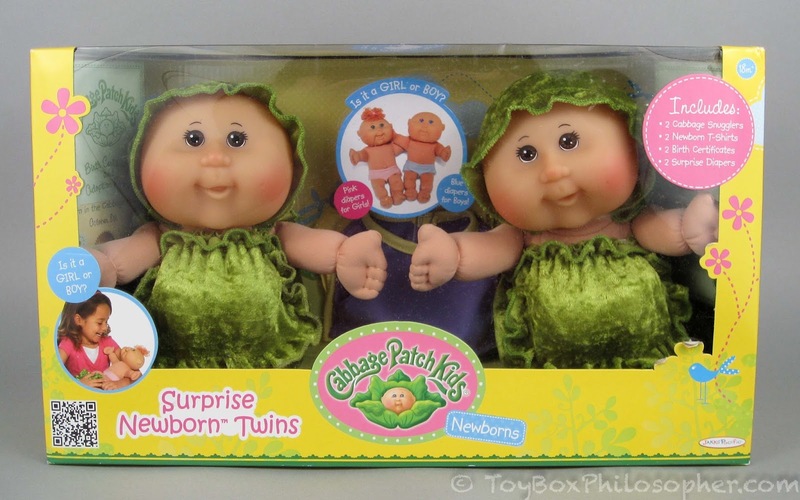 Cabbage Patch Kids Surprise Newborn Twins (discontinued) by Jakks Pacific. I'm almost done with the My Twinn Project! For anyone who is just tuning in, today's story is the follow-up to a previous post (which you can find here). I really love projects like this--where something that has lost its shimmer becomes beautiful again. When I was a kid, I liked to flip through my mother's magazines to find the makeover stories. I've always been fascinated by the magical transformation of a good makeover. Not that show Extreme Makeover, though. I did not like that. Anyway, I suspect it's all wrapped up in my obsession with the Cinderella rags-to-riches story. I feel a little bad for Curvy Barbie and Lammily, though. They're lovely dolls and I had a great time reviewing them, but I kept wanting to sneak away and work on the Twinns. And speaking of Barbie, I want to take a moment to thank everyone who informed me about the articulated Curvy Barbie (oh, yay!) and the hidden charms of the Petite and Tall Barbies. What wonderful news! I will have to check those out. There will be one more My Twinn Project post after this one--a finale where I'll reveal the completed 23" dolls (and the baby). Today, though, I'll just be checking in with the larger girls and updating you on their progress. I'll also show you how the eye replacements turned out on my 18" dolls. And...maybe I'll introduce someone new. Because, as I mentioned, I always seem to go overboard with this kind of venture. Holly with her new wig. I'm so happy that my project idea sounds fun to some of you! I'm certainly having a great time with the Twinns. The big girls have their wigs and the smaller girls have new eyes (for better or worse!). They should be ready for a quick update in a few days. In the meantime, there's a fun pair of fashion dolls that I'd love to talk about. In addition to the new line of DC Super Hero Girls, Mattel has recently premiered a wider range of body types for the Fashionista Barbies. There are now Petite, Tall and Curvy characters. I was especially interested in the Curvy dolls because of my fascination with Lammily--the first fashion doll that attempted to represent realistic body proportions. 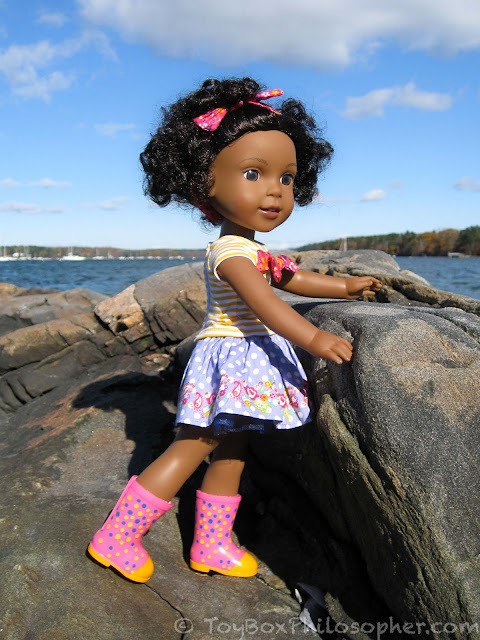 The original Lammily doll made huge waves when she entered the market in late 2014, and I feel pretty certain that Mattel introduced their new Barbie bodies as a direct result of the popularity of Lammily. 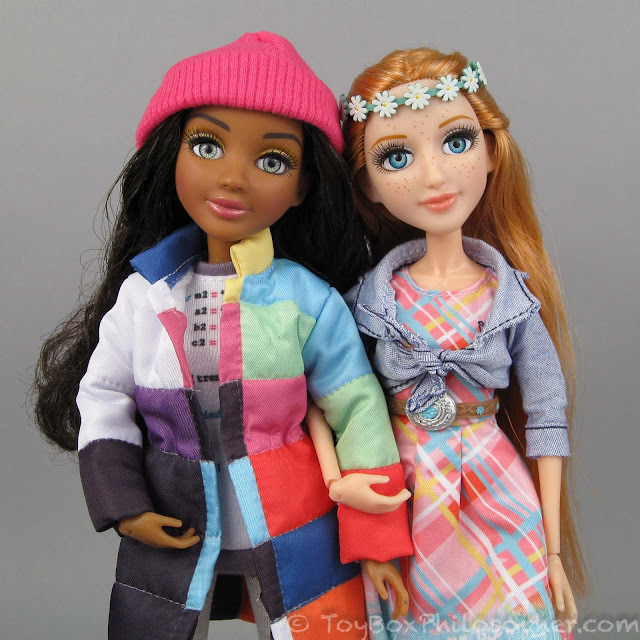 And there's nothing wrong with that--in fact, the more inclusive the fashion doll market becomes, the better. The Lammily company has also been super-busy lately. They've introduced a wonderful line of fashions (including Olympic gear and some exclusive handmade dresses). There's even a bee keeper outfit! Their second female character, Photographer, was introduced for pre-order about a year ago and started shipping in early June. The first male Lammily doll (a young man who spends his time helping animals in need) is expected to arrive this November. Since I've been away from the blog for so long, I figured I would try to catch up a bit by looking at Curvy Barbie and the Lammily Photographer in the same post. This might not be wise, but here it goes. "So Sporty" Barbie, $19.99 (left), and Lammily "Photographer," $25.00 (right). One of my new ideas for the blog is to write about the doll-related projects in my life. I could call this series of posts "regular person attempts tricky things that you can learn from the internet!" but I'll probably just put the word "project" somewhere in the title. I love a good project. I've documented project-like things in the past, but I'd like to make it more of a regular occurrence. The basic formula will be to set the scene in a relatively short post and then publish a few progress updates--interspersed between my more conventional reviews. This way you'll get to follow along and share in the suspense as I succeed (or fail!) in my endeavors. When the project is complete, I'll put together a cumulative post with some concluding pictures and statements. Let's see how it goes! The first project involves My Twinn dolls. My Twinn went out of business in January. I was sad to hear this news, but it didn't come as much of a surprise. By late 2015, the quality of the 18" dolls was plummeting, there was a glut of unsold, mega-browed 18" Adopt-A-Friends, and the company had ceased production of dolls with darker skin tones. The situation didn't look promising. 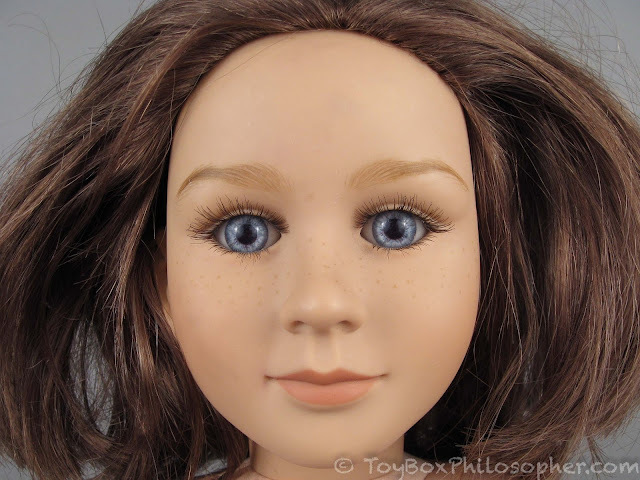 The way I see it, My Twinn dolls were made great by four critical things: a great range of customizable options (including over 40 face molds), overall high quality of construction, beautiful inset eyes, and carefully hand-painted eyebrows. Many of these features had gone out the window by the time My Twinn closed its doors. Like many collectors, I think the best versions of My Twinn dolls are the ones assembled in Denver, Colorado from 1995 through 2001. These dolls have high-quality vinyl, beautiful (durable) eyes, nice wigs, a variety of faces, and (occasionally) artist-painted eyebrows. To commemorate the end of My Twinn, I decided to add one more of these vintage gems to my collection. The Denver dolls are all at least 15 years old by now, though, so adopting one is likely to involve a bit of restoration. This project will document what kind of work can be required...and how I struggled through it. My Twinn Audrey from 2001. Well, that was a long delay in between reviews. As many of you know, blogging was getting complicated for me, but then life got pretty complicated, too, and I needed to step away from the computer. But I can't seem to quit dolls, and I also miss you guys. So...I'm back. As a kind-of warning, though, I don't think the blog will be exactly the same as it was before. Specifically, I no longer think of this as my job, and can no longer attempt to buy and review everything new or popular. 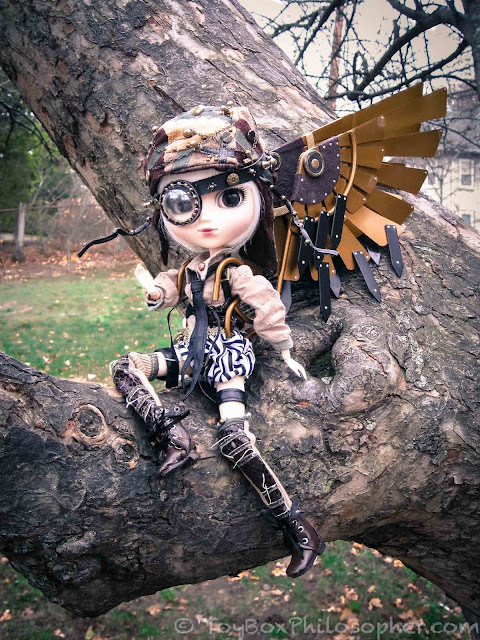 But I'd love to review and talk about whatever doll passion or project I happen to be wrapped up in at the moment--or share some of my older dolls with you. Despite the changes, I hope that this will still be a useful or diverting place for some. Thank you for coming back, and thank you for all of your kind messages and heartfelt concern. That's all I'll say for now because there are a lot of dolls to talk about! 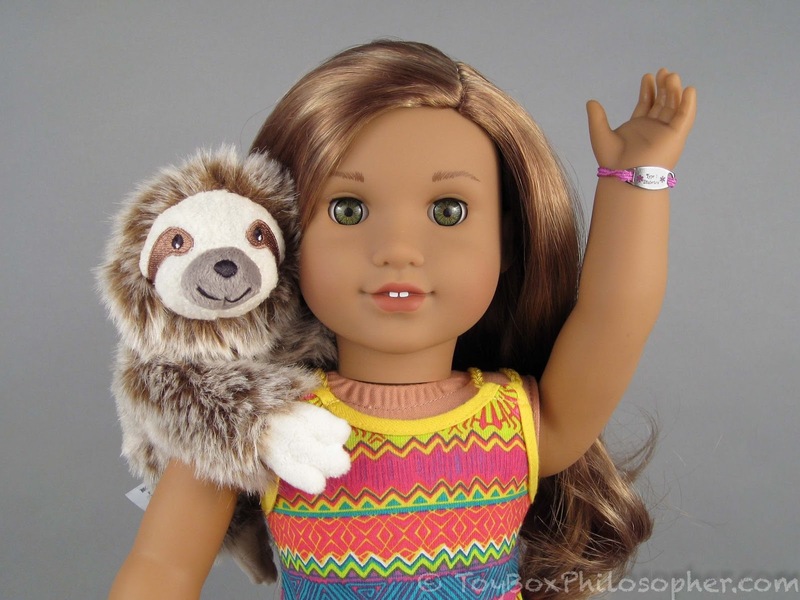 While I've been away, Mattel has been taking the play doll world by storm. Specifically, the new Barbie body types and the awesomely powerful Super Hero Girls are turning a lot of heads...including my own. I actually want to credit Mattel (and a few others) for luring me back into active doll collecting. 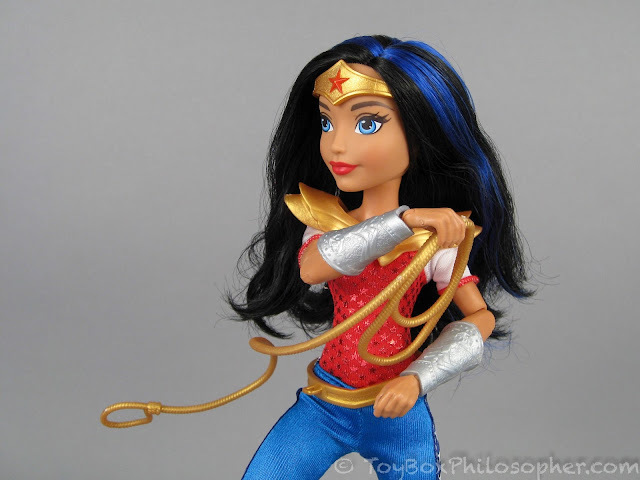 Today I'll be looking at two of Mattel's DC Super Hero Girls: Wonder Woman and Power Action Wonder Woman. This teenaged version of Wonder Woman is a main character in the new Cartoon Network series, DC Super Hero Girls, but I won't pretend I knew that when I bought the dolls. The fact is, I've always loved Wonder Woman more than the other female super heroes. I even had the Underoos, if you must know. I'll do a thorough review of the debut Wonder Woman doll and then I'll take a look at the Power Action version to provide some comparison--and also to make up for lost time. DC Super Hero Girls debut "Wonder Woman," $19.99. 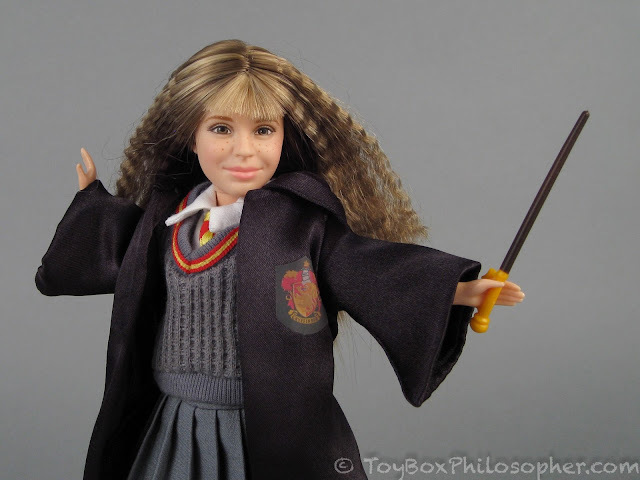 In my post about Mattel's 2001 Hermione Granger play doll, I mentioned that I had another Hermione to review. Several of you guessed correctly that it was Star Ace's new sixth scale figure from the My Favorite Movie series. 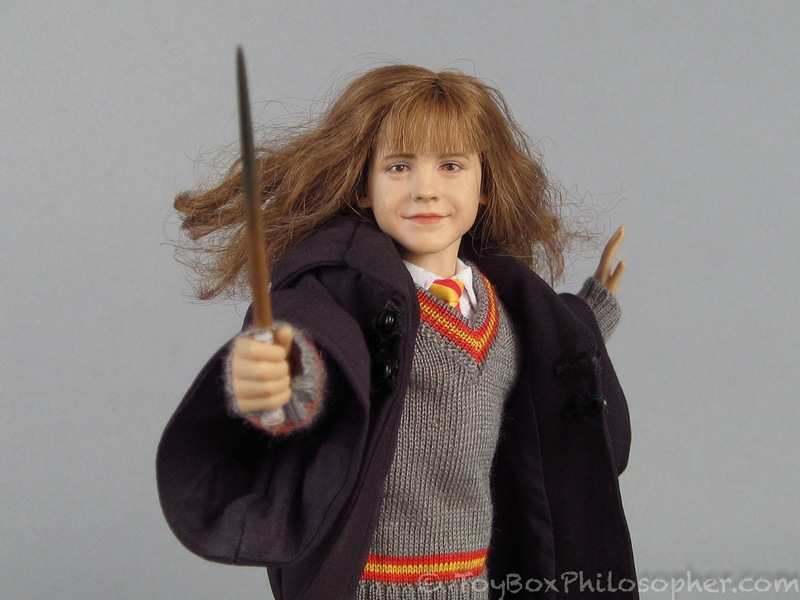 Aside from the fact that both of these Hermione dolls portray Emma Watson's version of the beloved character from The Sorcerer's Stone, they have very little in common. First of all, the Star Ace figure costs about ten times as much as the Mattel doll: a whopping $210, to be precise. However, Sideshow Collectibles has a great payment plan, and so I was able to make this purchase slowly over a period of almost half a year. There are other differences--in size, quality and articulation to name a few, and also the fact that Star Ace's Hermione is not yet discontinued and can still be found for sale in several online locations. Sixth scale Hermione Granger by Star Ace Toys, $209.99.